The highlight of any LEGOLAND park, Miniland USA is a walk around and through attraction built entirely from standard LEGO bricks, in LEGOLAND Florida’s case, over 25 million of them. Most models are built to a scale of 1:20. As well as soundtracks from the actual places, Miniland USA contains interactive elements so kids can push buttons to turn on fountains and race cars, etc. At night, the building are fully illuminated from within. Miniland USA showcases famous America cities and landmarks and two fictional scenes, complimented by a beautiful view across Lake Eloise. Naturally there is a special area dedicated to the State of Florida. At the Daytona International Speedway you can race LEGO brick cars along a drag strip track and the main model includes details of the roadways, pit area and victory lane. The grandstands alone contain thousands of LEGO people and have recently been remodelled following the major upgrade at the real thing. New York boasts the Freedom Tower, Rockefeller Plaza complete with water fountains, animated yellow taxicabs in Times Square, Broadway, the Statue of Liberty, a cutaway view of Grand Central Station, the Guggenheim Museum, Bronx Zoo and of course The Empire State Building. California is represented by San Francisco and Hollywood with the iconic Golden Gate Bridge, Chinatown, Fisherman’s Wharf and the famously steep twisting switchback Lombard Street of San Francisco. No Hollywood scene would be complete without the Chinese Theatre and the famous sign but in Legoland’s case it reads LEGOWOOD! In Washington, D.C. you will find models of the many landmark buildings like the White House, Capitol Building, Smithsonian, Washington and Jefferson monuments, museums and parts of historic Georgetown as well as the World Ware II Marine Corps War Memorial. There is animated marching band in front of the Capitol and tiny cherry trees blossom every spring. More than two million bricks were used to build Las Vegas alone. It showcases the amazing Las Vegas Strip including many iconic landmark casinos and hotels such as the Luxor Las Vegas, New York, New York Hotel and Casino, Excalibur, Mirage, Treasure Island, Tropicana, MGM Grand, Venetian, Stratosphere tower and Paris Las Vegas with the balloon sign and Eiffel Tower. There is even a miniature wedding chapel and working monorails. The whole State of Florida is represented from Mallory Square and Sloppy Joe’s Bar (spelt Moe’s) in Key West in the South all the way to the antebellum mansions of Florida’s Panhandle in the North. Amongst the Floridian cities and landmarks you will find the State Capitol Building in Tallahassee, Tampa, the Everglades, orange groves, Bok Tower, South Beach Miami with its Art Deco hotels and St. Augustine with the Flagler College and the Castillo de San Marcos fort. You’ll even find a replica of the Panama City Miracle Strip amusement park but you will not find Mickey Mouse here! However you will find ICON 360 with the Orlando Eye (also owned by Merlin Entertainments). NASA’s Kennedy Space Center includes a model of a Space Shuttle on the launch pad, the special crawler and the gigantic Vehicle Assembly Building (VAB) as well as the Kennedy Visitor Center and rocket park, processing buildings and the countdown clock. The first fantasy themed land is Pirates’ Shores based on the ever popular LEGO Pirates brand. Here you can see a Caribbean pirate haunt with shipyards, town and fort and watch two opposing pirate ships battling it out. 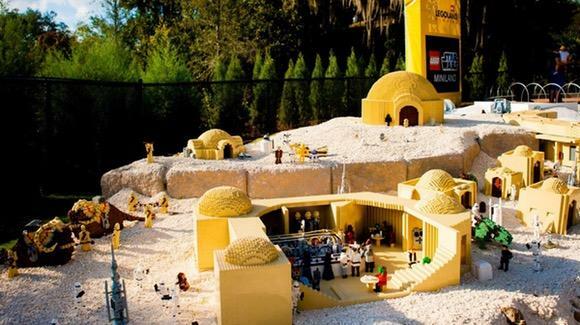 Following in the footsteps of LEGOLAND California, LEGOLAND Florida has also introduced a Star Wars Miniland Cluster but it is promoted as being more interactive than its Californian counterpart. It opened in November 2012, and is the newest miniland featuring major events from the six Star Wars films and the animated “The Clone Wars” TV series and follows in chronological order. All told some 1.5 million LEGO bricks have been used with around 2,000 separate models, some as much as six feet tall. Like the rest of Miniland, all the models are built to around 1:20 scale. Whilst lacking some of the excitement of rides and shows, Miniland USA is a great hit with both young and old.